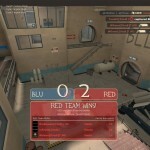 PS: The first impression of ctf_well is that it’s huge for a capture the flag map. 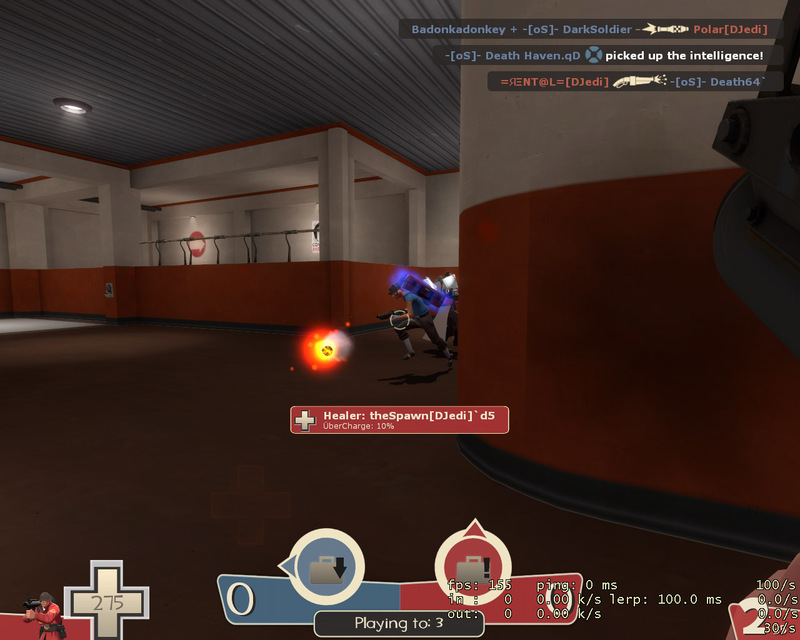 A modified version of CP_Well, it feels and plays like a total hack job and makes just getting into the enemy base a chore. 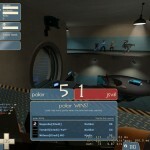 I hope leagues consider never running this in competitive play again. 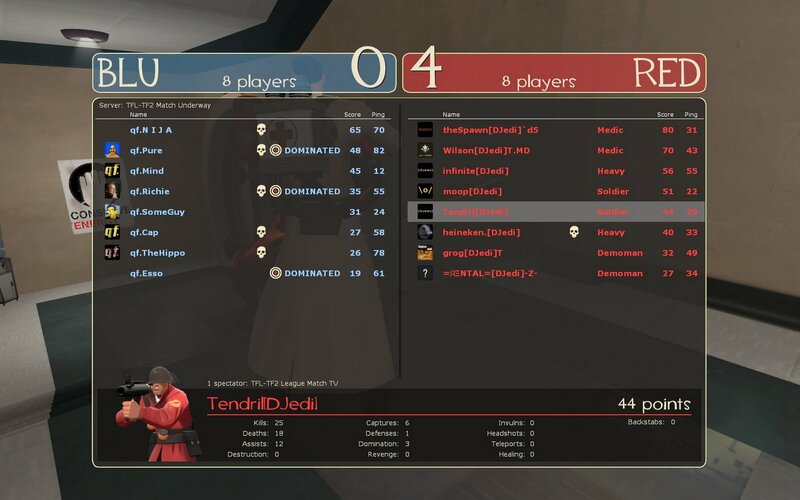 Last night Digital Jedi faced off against some old friends, Quantum Flux, on cp_labor, a map we have never played in competition before. We weren’t really sure what to expect and started off with a traditional lineup involving a mix of classes including scouts. We also had a new personnel lineup which included a few new Trainees with Wilson and Grog and the return of an old salt, Moopwrangler. 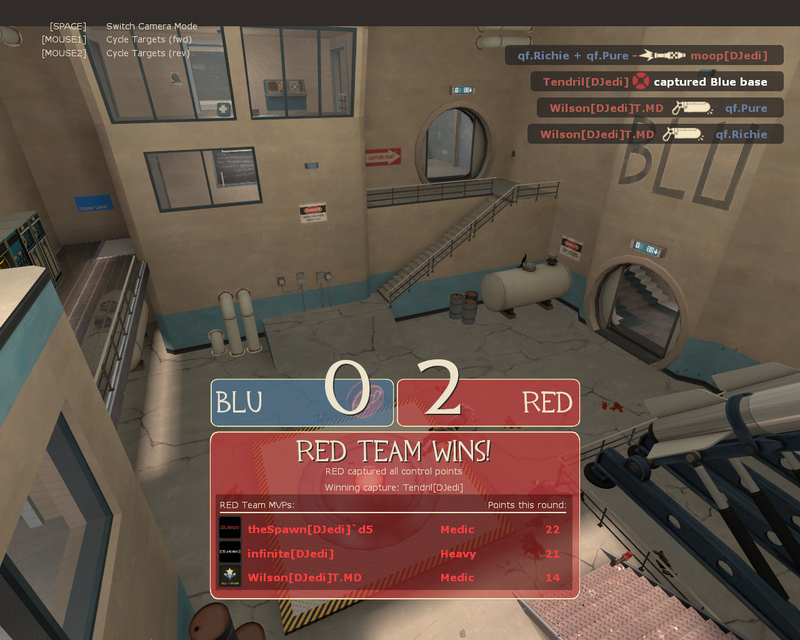 The first round started like most CP maps with a hard fought battle for the middle capture point. Hein beat qf to the middle as scout and capped as much as he could before dying in a hail of gun fire. 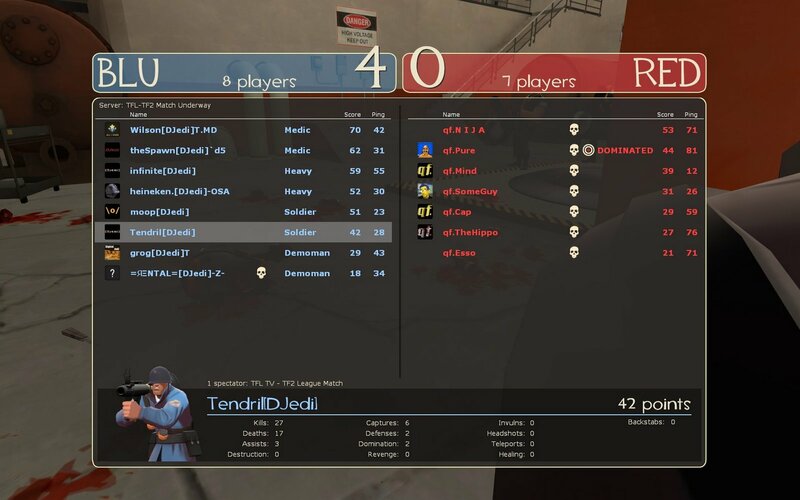 DJedi moved into position and captured the middle and with lots of qf dead, pushed to CP4 while their wave of respawned players got into position to hold us off their last point. We ubered in and picked qf apart slowly and were able to capture their last point to go up 1-0. We started our 2nd run in pretty much the same way, except we lost the middle, and lost our 2nd control point and were gearing up for a defensive stand against incoming ubers. We counter-ubered and block the ability of qf to capture the point and when the battle was over, they had 7 down and we pushed out of our base. We recaptured the middle and pushed into CP4 and pushed them back into their base and finally captured the point to go up 2-0. 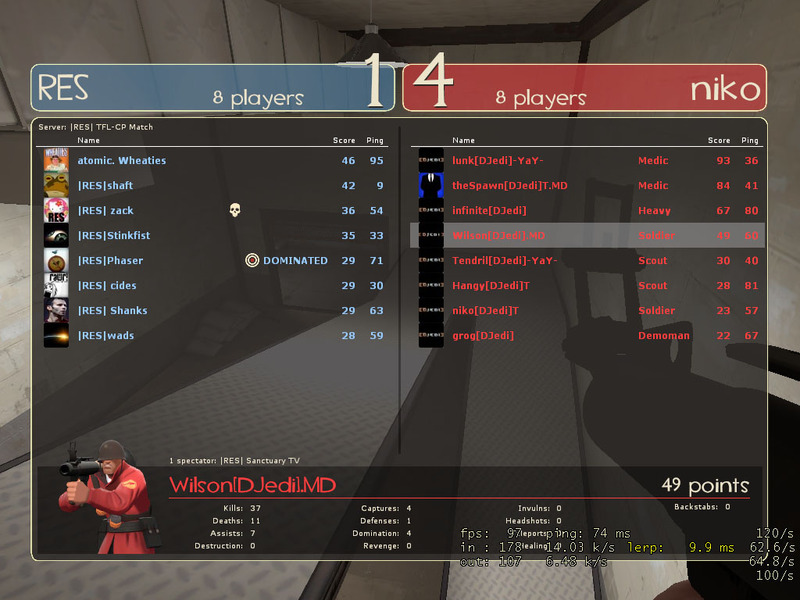 Once again, on our 3rd run we lost the battle for mid and were pushed all the way back to our base. 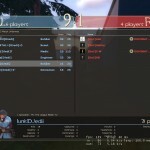 This time QF had some definite momentum and has us dead-to-rights on our last CP as we rushed to defensive positions. 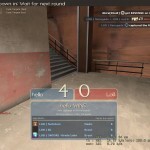 Hein, having switched to heavy from scout a few runs ago, was able to jump on the point to block a capture while dodging stickies that a demoman was planting all around him. 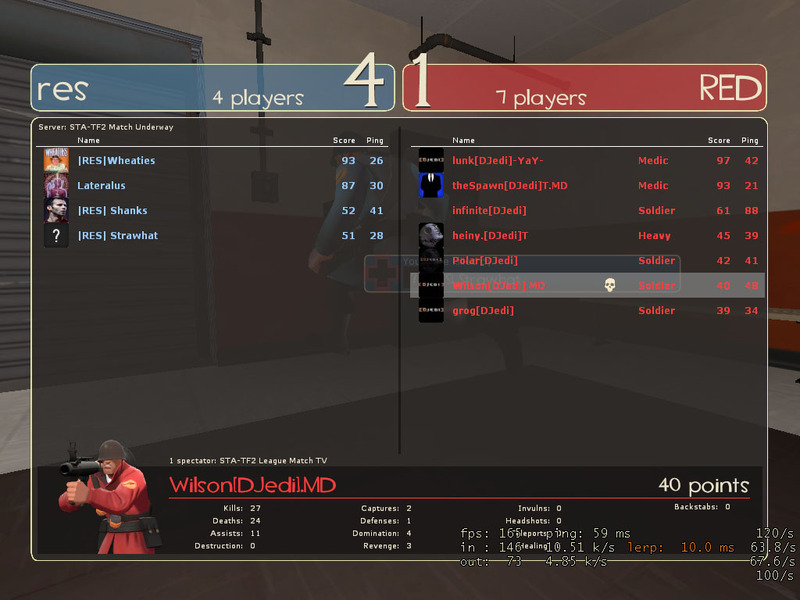 Bobbing and weaving as heavy/medic hein and theSpawn successfully defended the back point with only a few seconds to spare and after the dust settled all of qf was dead and we were pushing with great haste to recapture the middle. Knowing we were coming for it, QF anxiously rushed out of their respawn only to be met with multiple critical stickies from Rental on their respawn door. Operation Omar Little gayed about half of Quantum Flux and allowed DJedi to take back control of the fourth capture point as Tendril rained critical rockets on the remaining defense and left qf reeling on their heels. 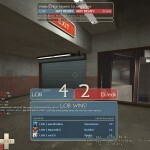 Moop and Wilson pushed in to the last point with an uber and moop critted one medic and ran away from the uber qf’s second medic blew and amazingly managed to live. Rental swooped in with lots of people distracted or dead and a RENT-A-CAP capture ensued. From my point of view, they did a good job at mid, getting into high positions on our side. We let them get pressure on our final points a few times. They were definately prepared, getting into the high ‘ramp room’ and piping us in. 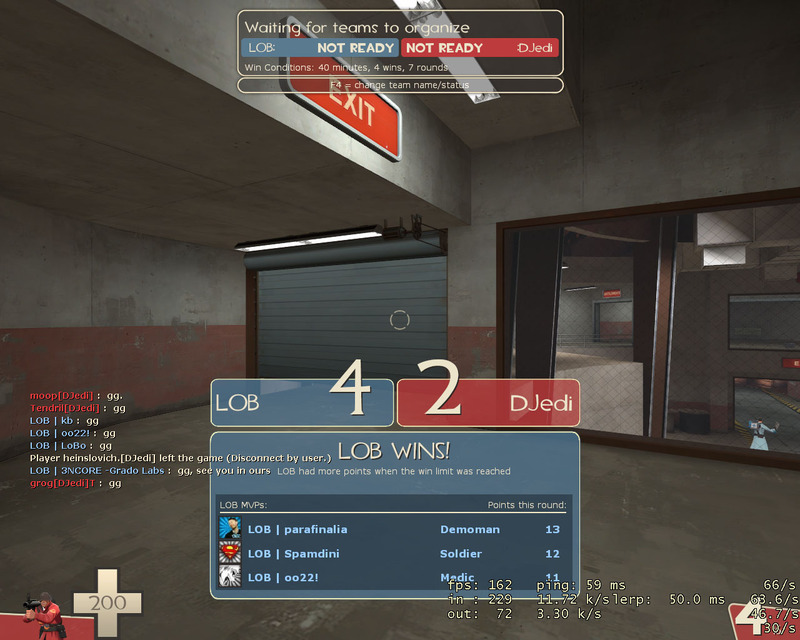 Somehow we broke through, got some kills and pushed them all the way back to their last cp. Once there, we piped them in while we built our ubers and took the caps. Overall it seemed we did a great job of counter-ubering. 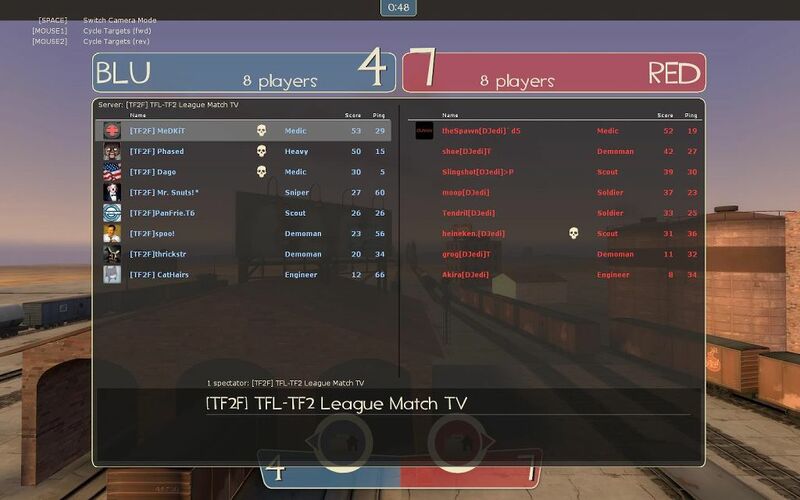 Thank you to the TFL admins for allowing this match to happen. We were originally scheduled to play a new clan from Ecuador and qf was on a bye for the week. 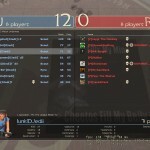 Great games to Quantum Flux, it was a great match and I’m glad we both got to play last night. 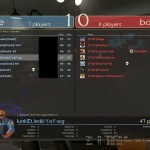 Last night for TFL we met with The Pact for two, 30 minute rounds on cp_granary. 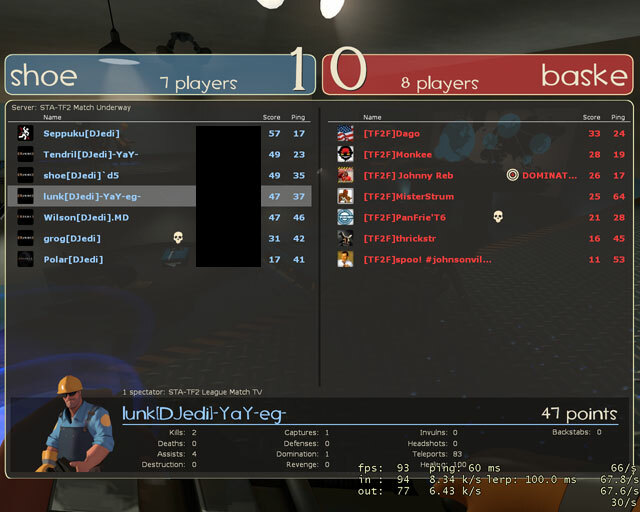 For the 1st round we started out on Pact’s server and we started out with a pretty heavy lineup running no scouts. 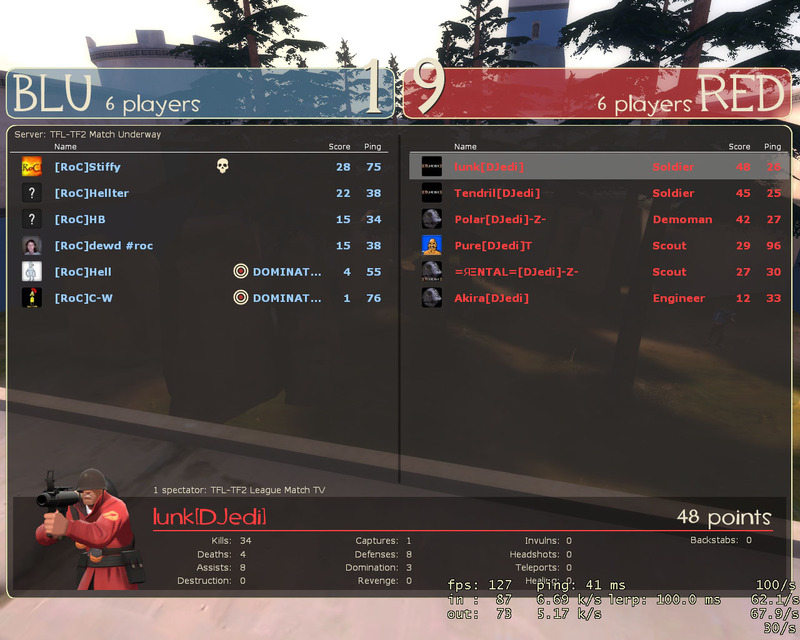 Pact beat us to the middle with 3 scouts and were attempting to capture the middle when we rolled in from all angles and proceeded to frag our way to oppressive dominance for the remainder of the match. This is most clearly shown in this screenshot from Slingshot[DJedi]>P in which he is dominating all 8 players on Pact at the same time. 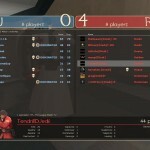 The 2nd round we started out all scout in an attempt to complete Operation X16(tm), but once again, Retro ruined it. 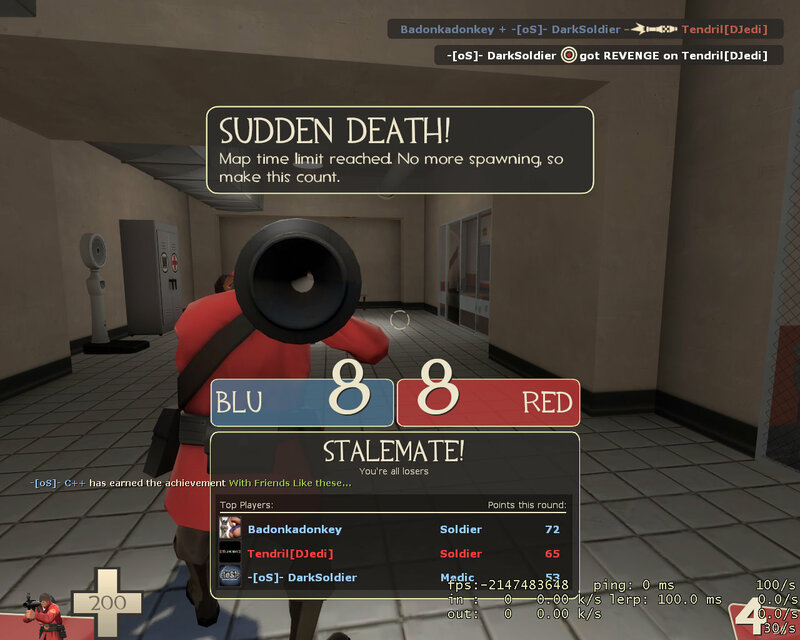 This time he was changing video settings when we ready’d up to begin the match and we didn’t realize it, but still, his fault. 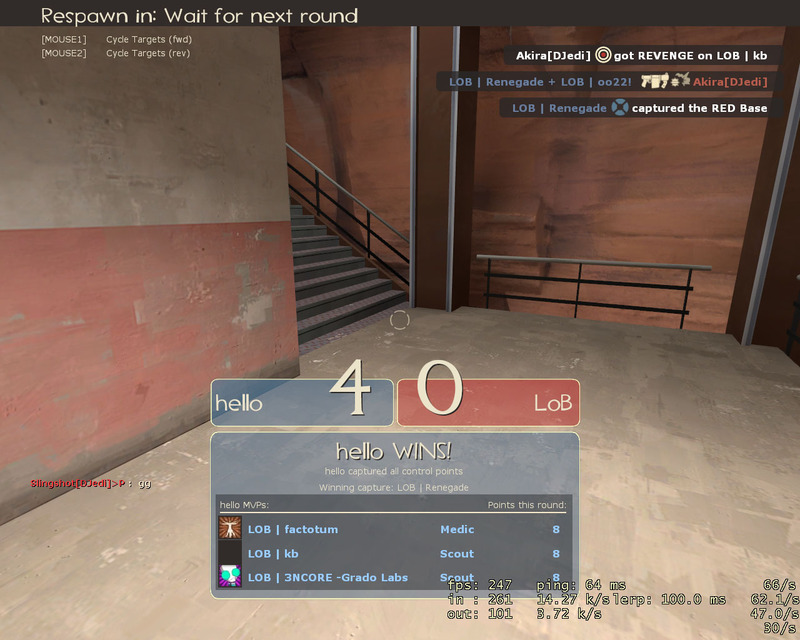 Scout rush proved to be extremely effective and we went high, low, left, right to throw Pact off and avoid their countering Pyro rushes. The 2nd half diminished from a serious match to an all out fun filled party with both clans throwing the strats to the wind and running around having a good time. I’m very impressed with these guys, they took a pretty brutal beating, but stayed throughout the entire match, played with honor and never gave up. 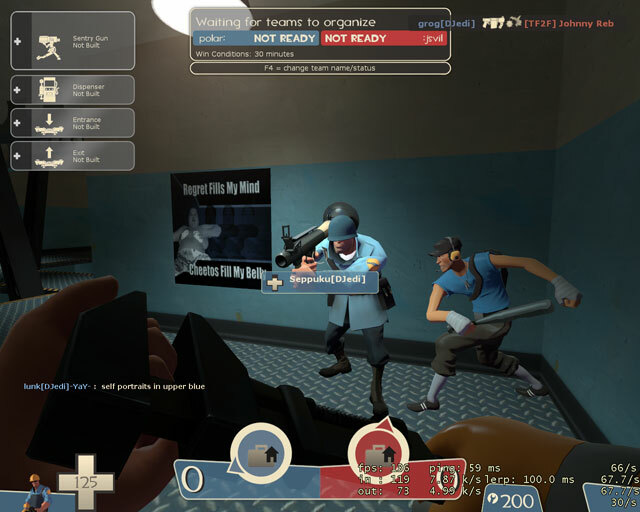 These chracteristics reminded me of the old days and, after a little research, possibly the most surprising thing was that The Pact is a Quakeworld Teamfortress clan. 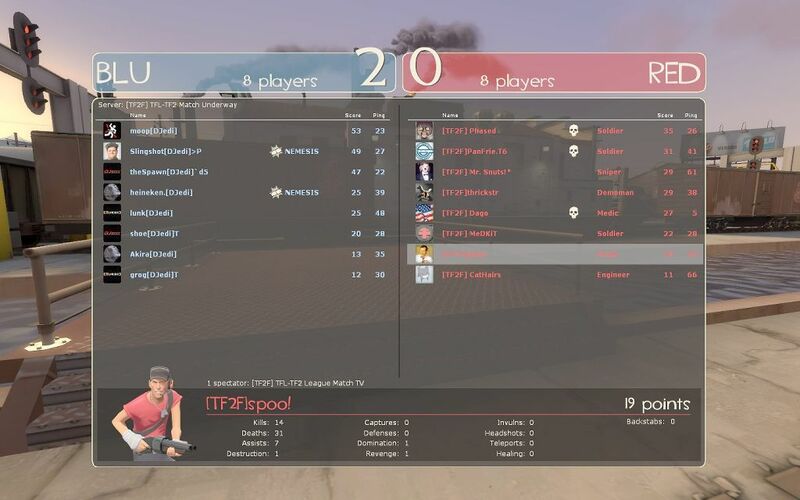 I don’t know how I don’t remember these guys, but I’m very glad to see some of the original TF players sticking around and coming back to play TF2. Look forward to facing off with you in future competitions. 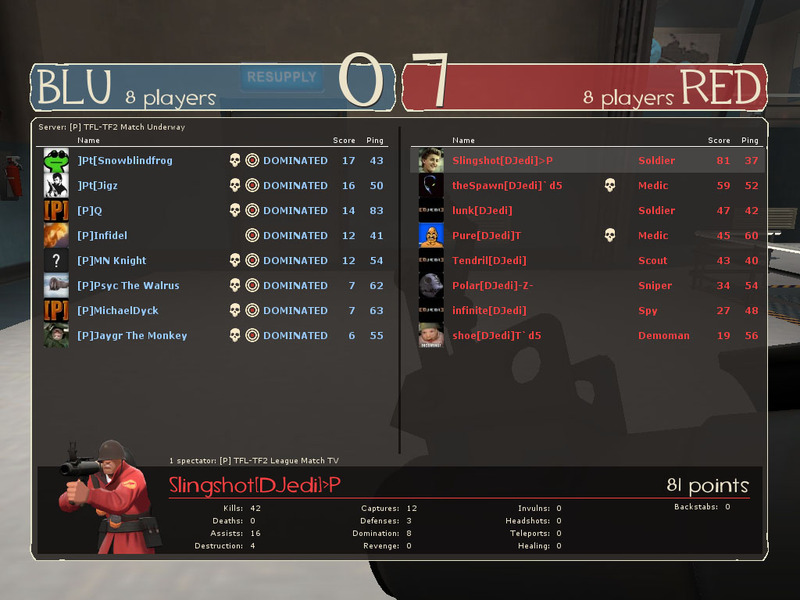 This match started off not so well with neither DJedi or RoC able to field 8 members. 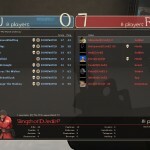 We agreed to play 6’s on the same map, Stronghold_b5, with the same standard TFL class restrictions. The first round we started off with 3 d and 3 o and proceeded to pull out a quick capture. Our defense only allowed our flag to inch forward a little bit at a time, but with such a wide open map and with so few people on each team it was tough to stop them from getting touches. 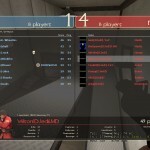 This was one of the best matches we have played in a long time. Maybe even topping the nail biter against [ABLE] a few weeks ago. We warmed up against dance using a ringer and hoped that we had enough people. 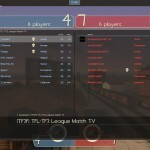 Lunk made some frantic phone calls to find enough players for both the scrim and the match. Slingshot, who just moved, was without internet and couldn’t make it. Polar was watching a football game at a friend’s house, and Akira was probably eating dinner. We used a ringer to warm up and Akira called Polar who wanted to make sure we were playing if he showed. With everyone on the server, we waited for 12 of the 15 allowed minutes for Polar to traverse DC’s traffic clogged streets. 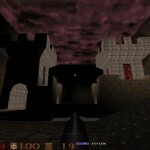 Round 1 started with a bang as their scouts rushed in to pull an almost immediate cap. We quickly tied it up and got into the groove of our strategy but with a strong defensive showing by oS we were down 4-2. We regrouped in the middle and started pushing forward with Operation Ryan Seacrest. Rental pushed up their gate and piped them in while the rest of the team ubered through the flag room to keep outSpoken pinned down while we capped in the background. 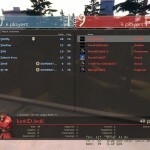 We were up by 2 caps and got pushed back hard by oS who killed 6 of us, then 7 of us to tie the round at 7-7. 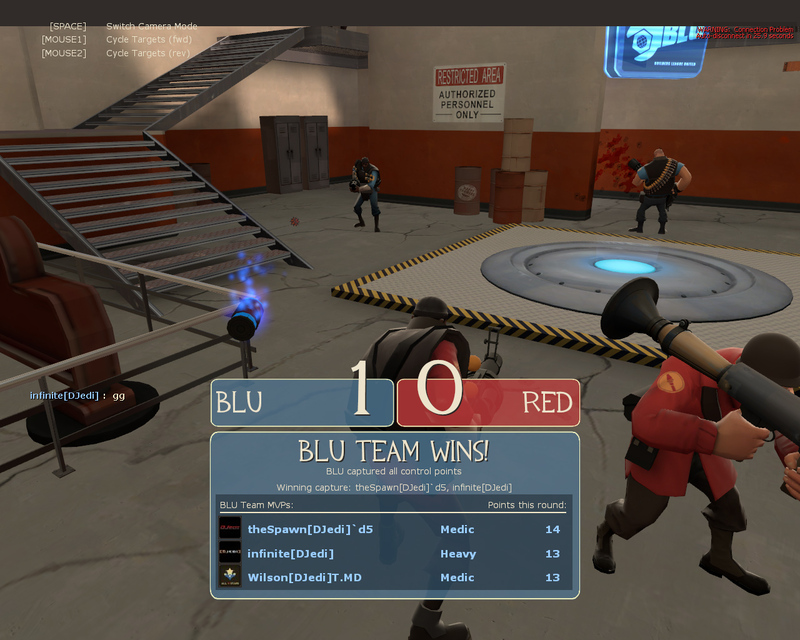 Both teams collected themselves and made one final push. With both flags in the middle both teams pushed and pulled trying to get the enemy flag to their own territory. Rental picked up the enemy flag and made a B-line for our base. oS capped with 2 seconds left in the match and Rental was in the flag room jumping for the tying capture when time expires. 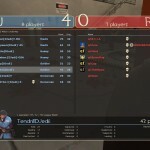 Great 1st round, oS over DJedi 8-7. 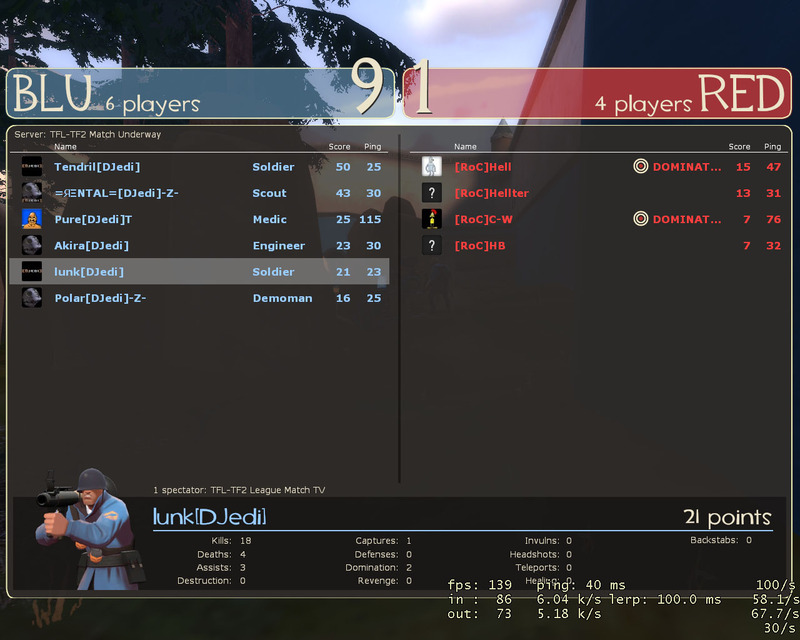 For Round 2 we switched to the DJedi server and proceeded to get going. We made a few adjustments on D, namely putting more than one person on it. 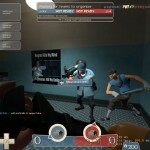 We switched Retro over to engineer to deal with the scouts dropping down through our vents. The 2nd round was very similar to the first, with both teams running highly effective offenses. 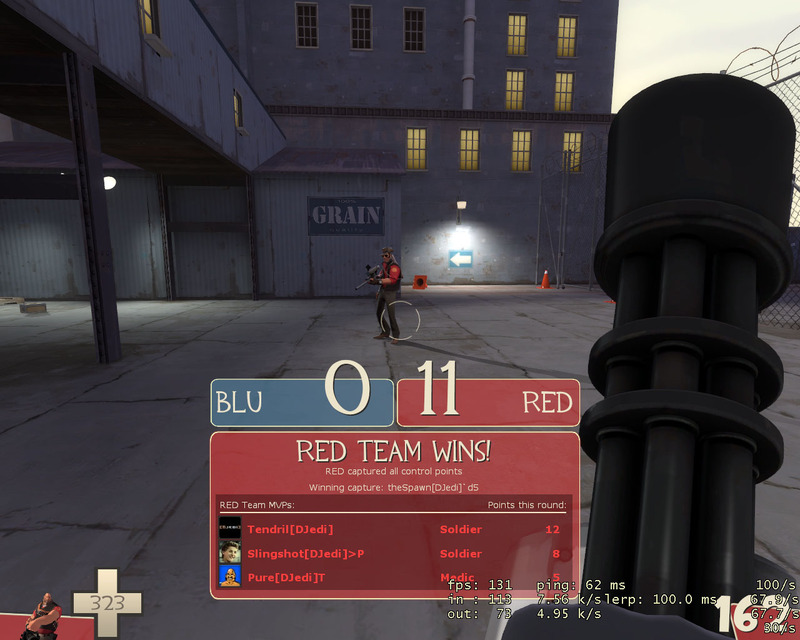 Once again we fought back and forth trying to get the edge on the other team, but every move one of us made the other countered. 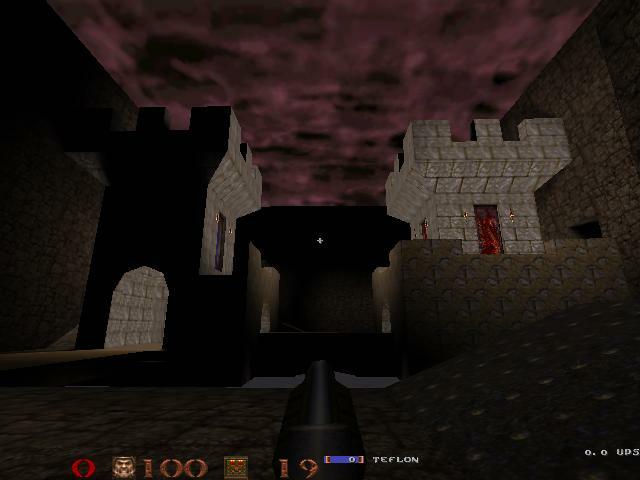 Scouts would push into the basement and double team the D distracting them while an Ubered soldier would run in the front door and destroy Retro’s buildings. Neither team showed any sign of slowing down their offensive pushes and in a highly contested 2nd round we ended in a tie. Round 2: Tie, 8-8. The tie in the 2nd round left oS up one cap (by 2 freakin’ seconds) to win the overall match and stay undefeated in TFL match play. Thank you guys for a wonderful evening and amazing games. 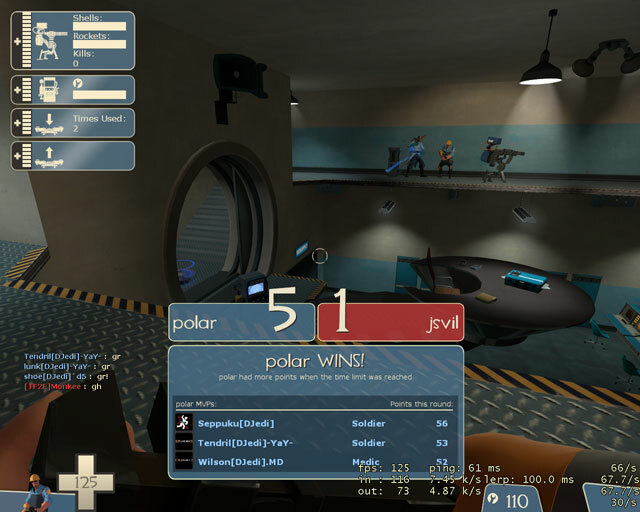 MVP goes to Polar, without him the match wouldn’t have even happened. 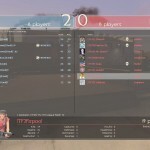 Clan outSpoken submitted this writeup when they sent the scores to TFL. 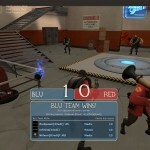 They also included stats for the games. Round1: We start by capping first and they quickly tied it up, after minutes go by we are up 4-2. Then all of a sudden Djedi is stomping at our door holding our spawn with some relays they go up 7-5, with some whips cracking we rally and get 2 caps to tie it with 2 minutes left. 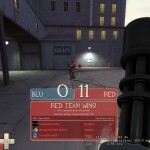 Both clans have flags pulled close to yards, our medic DS while trying to remember the flag toss button he taunts instead of dropping me the flag which almost costed us the round. But we get it and cap only seconds before DJ to win round 1 8-7. Round2: Went the same with us taking an early lead 4-2. But once again DJ comes screaming back and yet a round coming to an end with only minutes remaining DJ pulls to an 8-7 lead with relays. 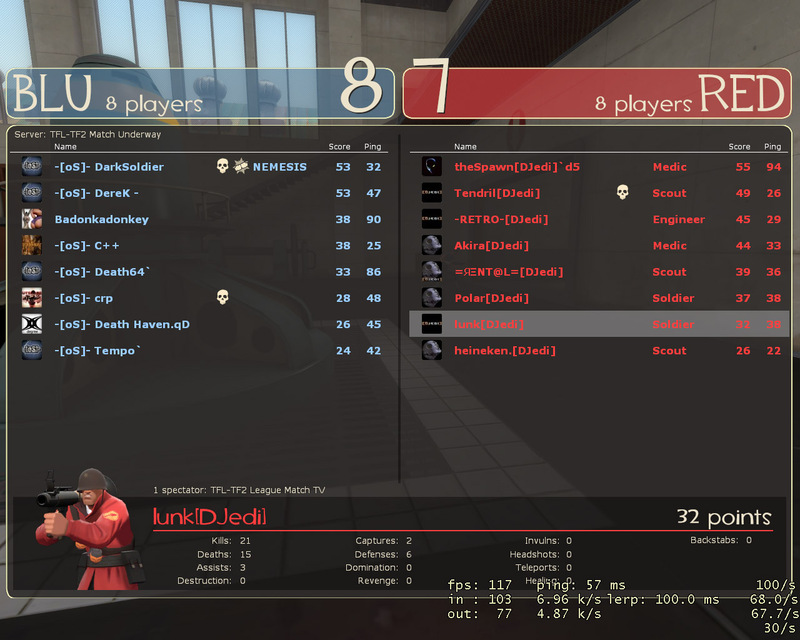 DH being the sneaky mexican he is, pulls and zig zag his way around soldiers to get a amazing ninja cap to tie rd2 8-8 and thus securing our victory with some holding ours til return at the end. 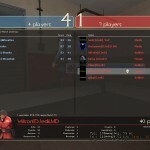 GG DJ, I havn’t had an intense match like that since TFC.